Smartxide Dot CO2 Laser Therapy (Dermal Optical Thermolysis) is a state-of –the-art procedure that Dr. Perez uses for laser skin resurfacing in his office in Overland Park, KS. 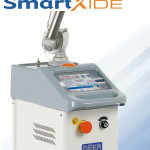 This Smartxide DOT System is an advanced CO2 (carbon dioxide) laser made in Italy by DEKA. This FDA approved CO2 Laser is the gold standard for skin resurfacing. Dr. Perez explains that this new technology is far more advanced from CO2 lasers of the past. The old CO2 lasers would burn the entire surface of the skin, resulting in a significant amount of downtime to heal, discomfort for the patient and prolonged redness of the skin. In addition, the old CO2 lasers could not treat non-facial areas like the neck and décolletage easily because skin in these areas did not heal as well as the face. The effectiveness of DOT Therapy is unparalleled and what makes DOT Therapy so special is its ability to adjust the treatment settings to provide a range of options. Dr. Perez can select a treatment that can fit into just about anyone’s skin requirements and recovery time. “ My patients are thrilled that we can customize the treatments to meet their exact skin requirements.” The results are extraordinary and the downtime is so minimal that some of my patients can receive a treatment on Friday and be back to work on Monday looking radiant. More aggressive treatments, however, can take up to 10 days to heal. So how does it work? This new procedure precisely delivers CO2 laser energy to targeted areas on the face or non-facial areas like the neck and décolletage, and effectively treats sun damaged, wrinkles, fine lines, and acne scarring. Unlike any other skin resurfacing CO2 laser, the DOT system is unique because it ablates a customized pattern of tiny, micro-sized dots, rather than the entire skin surface. This is also called a Fractionated laser skin treatment. After a DOT Therapy procedure, thousands of microscopic perforations stimulate new collagen growth to improve skin’s texture and tone. DOT Therapy leaves the skin around each of the perforations intact, allowing the epidermis to regenerate, resulting in a more youthful appearance. Also because of this fractionated treatment the melanocytes (cells producers of pigment) are not completely ablated, there- fore redness and hypo-pigmentation are eliminated as common problems. This laser skin resurfacing procedure is done in our office with the use of a local topical anesthetic cream. Most patients find it to be a comfortable procedure with quick healing time and favorable results.